1 of 4 In a small bowl, stir together bread, vinegar, garlic and 3/4 cup water. 2 of 4 Combine bread mixture, red peppers and cucumber in a blender and puree until smooth. then transfer to a large bowl. 3 of 4 Stir together the tomatoes, yellow peppers and onion. Puree tomato mixture, slowly adding oil while blender is running. Add to red pepper mixture and stir in salt and black pepper. Cover and refrigerate at least 2 hours. 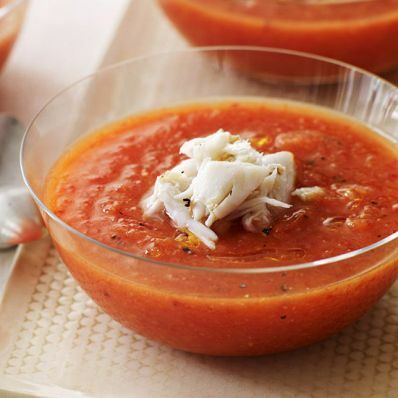 4 of 4 To serve, divide soup evenly among 8 bowls and top each with 2 tablespoons of the crabmeat.